In the year 2000, I was 18. I was heavily invested in music as a life saving mechanism. I slept with Tori Amos tapes on repeat and woke replenished. I spent paycheck after paycheck, earned while working on a marina on a tourist lake, on albums by women. I fell in love with Sarah’s Harmer and Slean, I devoted my heart to Patty Griffin. I’ve grown up since then. I graduated high school, went to college, failed out, and dropped the singer-songwriter women I had once so loved from my mixtapes. I stopped visiting that record store and I moved on to men with voices. I’ve let them speak for me in the last 10 or so years and with the exception of very few solo female artists, I ignore the woman who is making a go of it alone, on the back of just her own words and sounds. Such things are tragedies for ladies as in love with the idea of a woman powerful just because she is a woman. But such things are quickly remedied by the music of Savannah Smith. At just 22, Smith is talented beyond her years and that at first listen is certainly obvious. Her tumblr, that place that is occasionally a respite for young girls to fawn over fake Marilyn Monroe quotes and block type over Instagram photos, is full of intelligence and awesome Loretta Lynn t-shirts that typically girls of her age do not appreciate nor wear. This is not a slight against the younger women of my generation but I think it’s fair to note that Smith has transcended what we too often view as a representation of what makes a girl a girl in this day and age. Smith is smart in her musical icons (and really folks, that matters more than most know or will admit), and as such, is a shining beacon in a land of manufactured pop icons shoved down our throats as if there are no intelligent options for those of us ladies that wish for beauty, thoughtfulness, and utter truth in our music. In a world where Taylor Swift, lovely as the young girls think she is, can get a record deal and Billboard hits because she got broken up with and can rhyme a few words together decently, Savannah Smith is a breath of fresh air. 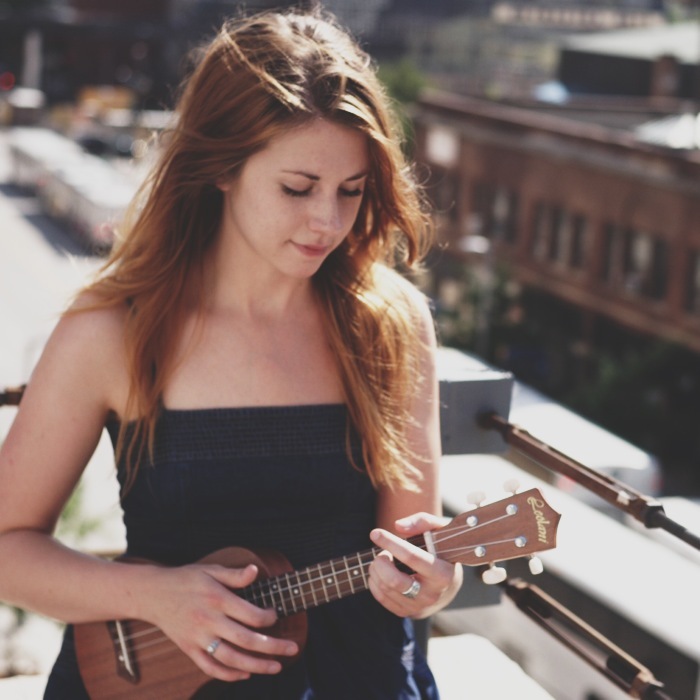 There is hope for your young girls, there is hope for our gender, there is a light at the end of the tunnel for a girl who loves her ukulele as much as all the other girls love the idea of their wedding. She is a refreshing reminder in this day and age when too much stock is put into the color of your prom dress instead of the contents of your heart. We are smart, we can do it on our own, we have talent. Smith is proof of that. We are fed Rihanna and we are fed Nicki Minaj, as if those are our only options as women who are in search of a musician to speak for and with us. If you do not seek out your own Amanda Shires’ or Jenn Wasner’s then those are the options. Thankfully, there are artists like those women though and Savannah Smith to remind us that you can be smart and adorable all at once. You can adhere to your ideals and your love of your of your uke, however unconventional, and I will hear it. Girls like me will get it and love it. The guys at Show Me Shows will hear it, recognize it’s merit, and they will produce beautiful videographic memories of it, like the two above. 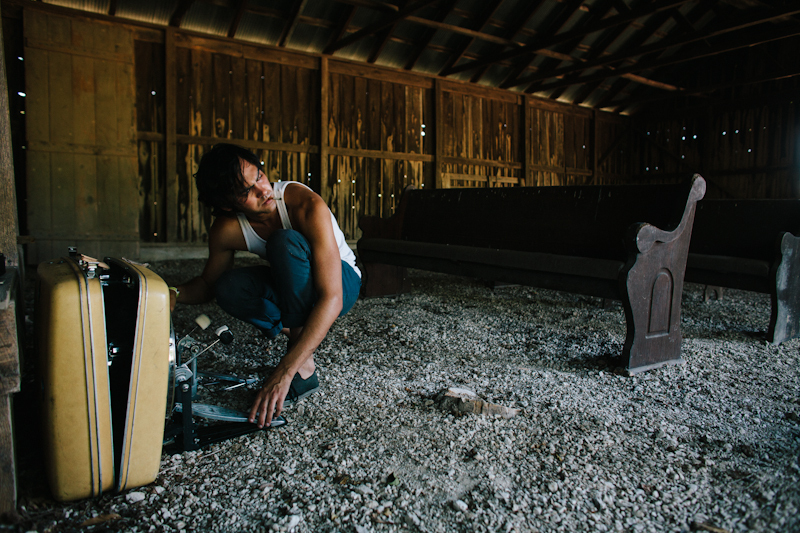 Shakey Graves is actually Alejandro Rose-Garcia, a name no one could seem to hold on their tongues Friday last when he made the trek from Austin to a small, rural Missouri town for a show on an old porch. All night he was just Shakey. Shakey, you want a Busch heavy or a Strongbow? Shakey, you like potato salad? Shakey, where in the hell did you get that drum? Not too many hours after Shakey was out in that chapel with the Show Me Shows guys, he was on a couch in a tiny house carefully exacto-kniffing small pictures out of a rather heavy military history book. Those were carefully glued to a tiny brown paper sack and stapled shut. Inside were CDs to sell at the show, handmade by the man himself as he bullshat with us. Hanging on the wall above him was a mess of 20 some photos, a visual family tree that includes descendants buried in that cemetery Shakey just left. Roundabouts nine o’clock nature dimmed its lights and we lit up the porch. Shakey placed his beer in the cleverest of mic stands and hung a cigarette from the headstock of his old Gibson. Then he set in with the music. 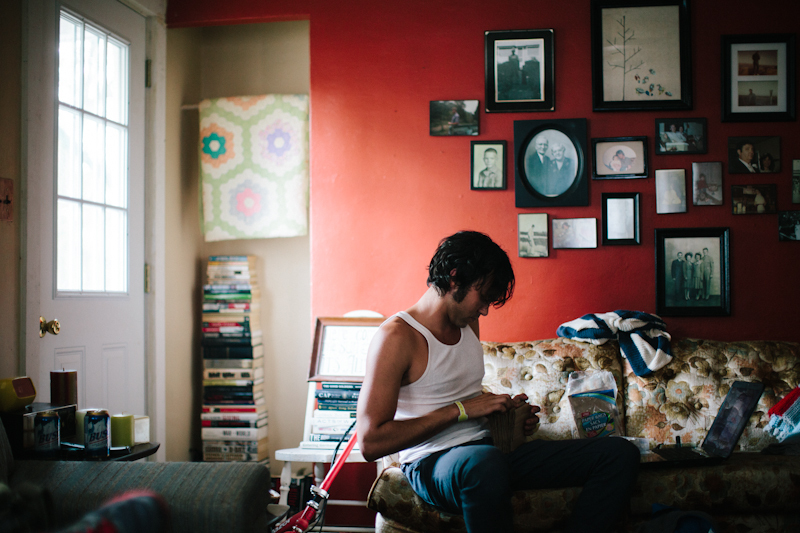 The music of Shakey Graves has made the rounds. There is a unique quality about it that makes it hard to pigeonhole, something so much indie music suffers these days, and explaining what you’re about to hear to someone’s who’s never laid ears on it is a tough pill. It’s folky but rock-ier than that. It’s kind of at home next to some current Americana darlings but it occasionally fits in with country (murder ballads, y’all). It is gospel sometimes (a lot of the time, actually) and it is blues. All of this accounts for its acclaim – it fits in New York, it’s at home in Austin, Texas (literally), and it apparently wins over a crowd here in our one stoplight town of just 1800 people. I stumbled upon Shakey’s only studio release in late 2010, but Bandcamp says it was released in 1987 so one can never been too sure when Roll The Bones was put forth. At any rate, I’ve been consistently returning to it over the past 20 months. It’s got longevity, this one. Even though Roll The Bones wasn’t Shakey’s only release (there was the EP, The State of Texas vs. Alejandro Rose-Garcia, a wonderful Lucinda Williams cover and original from two separate When You Awake compilations, and a Daytrotter session), it’s most likely what you’ve heard if you’ve heard of him. But even barring those little gifts we’ve been given over the past year and a half, Roll The Bones is an album full of songs that expand and are most adaptable. “Unlucky Skin”, the song that initially inspired our love, lends itself so well to its accompanying banjo in the original that it’s hard to imagine it working as well on an old Gibson in a cemetery chapel, but on those pews and within those two walls, it is still just a perfect. Ale (as he told us he liked to be beckoned as) sounds just as defectless in the studio as he does live. His guitar just as rusty yet untarnished. There is but one difference between the two venues, if you will: Shakey’s songs on a porch, the entirety of his repertoire, fill out. In a wooded yard of 25 or so people dancing and stomping their feet, they are intimate in a way that a room, even one with a soundbooth, cannot ever dream to recreate. But in a cemetery? 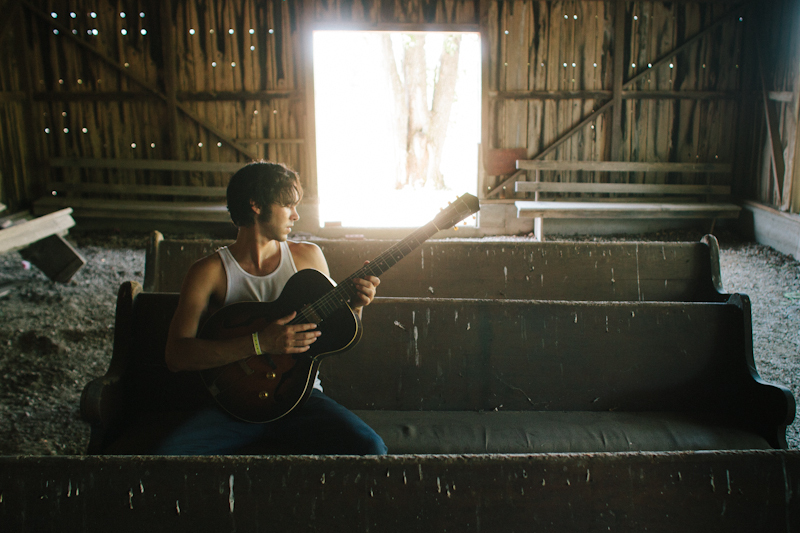 Shakey Graves, out amongst the gravestones of those gone before, now resting in a field? There. There those songs sound like they are truly home.